Too busy to blog this week because Spring has arrived! It was actually very warm here so I worked out in the yard every day. Put out 20 bags of mulch. Watched the hostas pop out a little more by the day. Watched the redbuds begin to bloom. Got my front porch geraniums. We had a new fence put in. Katie and I had to survey the progress daily. They actually built the fence one board at a time - which amazed me! It's beautiful. Watched the tulips begin to bloom too. What did you do this week? I hope it was a great one. 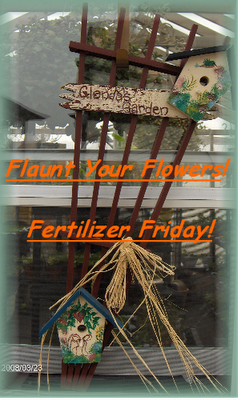 Today I'm linking with Tootsie for Fertilizer Friday and Melissa at The Inspired Room. Your yard looks great, our hosta's aren't that big yet. I did take some before pics and I am taking after pics as things come up. Purple Iris opened yesterday, just in time for Easter. Love your pictures...yes I think Spring has arrived...lots of rain going on right now...so no working in the yard today and maybe not ever tomorrow. My little bunny like the one shown got one of his ears broken...but he is still standing guard in the garden. I don't blame you for wanting to be outside. It has been gorgeous here, too. Love your fence, too. I love the style. I can't get used to those plastic privacy fences. Katie looks like she approves!! Have a happy and blessed Easter, Stacey! How fun to be in the garden every day. Everything is looking so pretty in your yard. Our weather has been beautiful here too. I've been gardening as much as possible. Love this time of year before the real heat sets in. I love watching the hostas come up. They are so fast. Mine are about a week behind yours. I love your Hostas and new fence, Stacey. Can't wait to see more of your beautiful yard ... especially the pond and waterfall area. Stacey it's looking very pretty at your place. Hi Stacey! Your yard is looking great! Aren't you loving the warmer weather? It is really becoming beautiful outside... everything looks wonderful! Have a HAppy Easter Weekend!!! One of my favorite places to visit is your stunning garden! I love that you have so much space and that it is all so lovingly cared for! Simply gorgeous! The geraniums on your porch are beautiful...my daughter talked me into planting hot pink ones this year...they are very pretty but red is still my favorite! I hope ya'll have a wonderful Easter weekend! I love that fence, Stacey! I can just see all sorts of little garden decorations hung on it. Looks like spring has certainly visit with you this week.Your yard looks lovely and I think Katie is enjoying the weater as well. Wow! Your gardens remind me so of mine. Lovely! We just laid 8 cu. yds. of mulch & are only half done ... got in some more azaleas (20) & (2) rhodies & lots of primroses today. Don't you just LOVE digging in the dirt? Wasn't today just the prettiest day!! I was able to get out and do some shopping today...and enjoyed the weather. I haven't got much done in my yard yet since I've been shopping for Easter. I did plant a few pansies in a flower box and pot..but so much more to do! Next weekend I hope to be out planting away! Hope you have a wonderful Easter Sunday with you hubbie and sons! It seems like yesterday that you shared the cold and snow pictures of your backyard. Time goes by so quickly. It is quite obvious that you spend many hours on your back yard. It looks like pictures from a gardening magazine. So beautiful! It is fun to see red geraniums again. I am sure Katie is thrilled that this time of the year is here again. I like the fence. Great addition! I have been doing some yard work, too. I think my hubby is actually going to get a Mexican guy to help me put put pine straw this year. He needs the work and I need help. I may have to use pine straw instead of mulch on my front beds since every time we get rain so much of it is lifting and floating away. At $5 dollars a bag I can't have it leaving. Have a wonderful Easter!! Too cool here yet to plant any flowers but things are beginning to sprout and I love it! I've been doing about the same. Each day watching what has bloomed from the day before. Happy Easter! Happy Easter, this is my first visit. I love Tootsie, go there later. Have to comment on your header it is wonderful,and an inspiring post, I will work in the yard some, Maine is warming up slowly. Can't really plant till middle May. We have had snow in April before. Happy Easter, Stacey! Hope your weekend is fabulous! Spring certainly inspires us to go outside and play:>) Your yard is already shopwing signs of beauty. I hope your Easter was extra special! Hope you had a nice Easter Stacey! I made it through the week with out catching the flu from the kids or Hubby. You really don't want to know what I was doing all week though! Everyone was good to go for Easter and we had a nice but cold day. Thanks for the well wishes. It is getting warm here too! And in a hurry! It is 86 right now! We have the craziest climate. I know your yard will be breathtaking! It was last year! We planted grass over the weekend, now we have to water, water, water! And it better grow!! We opened the pool, weeded and mowed this weekend. Your yard is going to be pretty again this year. Love the new fence. Your yard is looking much like Spring. I would be out there too. Glad you are finally seeing the signs that winter is gone. We had a chilly, but sunny Easter, but yesterday was windy and rainy. So thankfull for it all though. Your doggy even looks happy to be outdoors. What a great fence! It is so exciting to finally have springlike weather. If only the wind would stop blowing so we could enjoy it! Hi Stacey! Thanks for popping in to see me. Oh, you can copy me any time you like. I'm flattered! Hope you've still got some warm sunshine! Your yard is looking great! Love the new fence. I am totally and forever in LOVE with this new fence....love it! !